In the last century in West Texas, oil and gas exploration in the Permian Basin scarred the landscape. 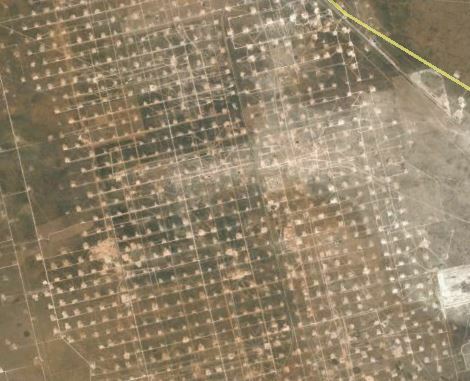 Below is a Google Earth view of an area of Ward County in far West Texas, showing the drilling pads and roads from oil and gas development. At the time of this development the surface of this land, dry and semi-desert, was considered relatively worthless, and the impact of oil exploration to the surface of the land was considered a small price to pay for the wealth of oil found under the ground. Today, landowners have become more ecologically conscious and protective of the natural environment of their lands. Increasingly, oil and gas leases are including provisions requiring restoration of the surface by exploration companies. But restoration of semi-arid lands in West Texas is not a simple task and requires patience and expertise, as well as significant resources. I recently ran across a series of publications by the University of Wyoming that describes strategies for restoring Wyoming lands disturbed by oil and gas activities. The University has created a Reclamation and Restoration Center in its College of Agriculture and Natural Resources, working with its School of Energy Resources. It has published a series of informative bulletins describing best practices for restoration of severely disturbed lands – how to preserve topsoil, re-establish plant species, and preserve natural habitat. One bulletin describes considerations for including restoration requirements in oil and gas leases on private lands. The bulletins are online and can be found here. While Wyoming habitat is not the same as West Texas habitat, they have a lot in common. A resource for landowners wishing to learn more about habitat restoration in South Texas is the Caesar Kleberg Wildlife Research Institute at Texas A&M University in Kingsville, which has experts on native habitat and vegetation.